A native of tiny Federal Dam, Minn. (population 110), within the Leech Lake Indian Reservation, Anne McKeig ’92 (HUSL) took daily 30-mile bus rides to Northland Community Schools in Remer. During her freshman year there, her class had an assignment to choose careers they were interested in and then report their findings. She picked dentistry, designed an eye-catching folder with the image of a mouth on its cover, and set about compiling her research. Although the basis for her epiphany may forever remain elusive, its wisdom has proven to be profoundly evident. After receiving her J.D. 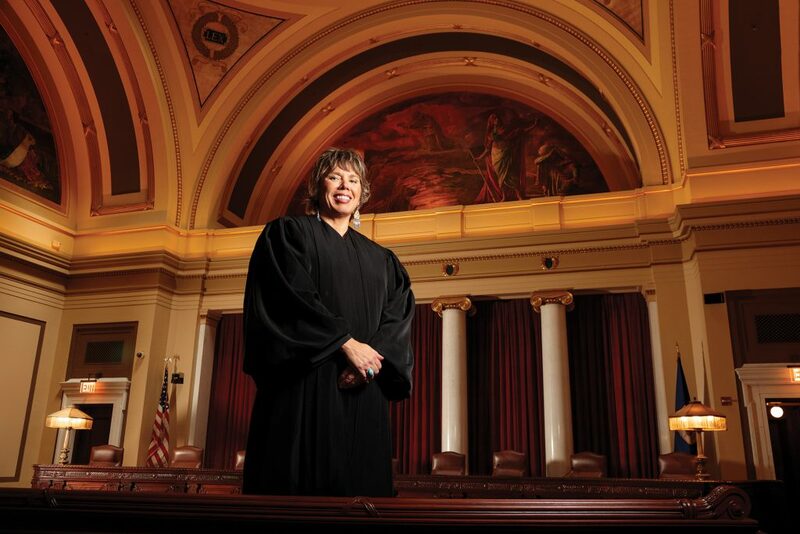 from Hamline Law in 1992, McKeig launched a successful public-sector legal career as a prosecutor and child advocate before becoming a Hennepin County judge. Then, in September 2016, she was sworn in as the first Native American to be named to Minnesota’s highest court and the first Native American woman to be named to any state supreme court. McKeig’s roots next to Leech Lake are deep ones she will never forsake. She is the middle child of five—two older brothers and two younger ones—and she describes her childhood in Federal Dam in almost idyllic terms. Her dad had a gas station and worked construction jobs. Her mother, a Bemidji native who graduated from the College of St. Catherine and earned a master’s degree in history from the University of Minnesota, was a Fulbright Scholar who dreamed of traveling but instead stayed in Federal Dam to raise her children. She knew she was good at writing and arguing, so when she followed her mother’s lead and enrolled at St. Catherine’s, she majored in English. didn’t even know was available. McKeig would go on to make connections at Hamline that would have profound influences on her life, perhaps none more so than ones she made at the very start of her first year. She and six other students met at an orientation session and formed an immediate bond that would last far beyond law school. During her third year at Hamline Law, McKeig made the rounds at campus interviews with some big private firms but didn’t like the feel of it, so she began thinking of public interest law. As fortune would have it, an opening arose in the Child Protection Division of the Hennepin County Attorney’s Office, and she landed the job. attorney in that office for the next 16 years. She worked solely on civil cases—those involving removal, reunification, termination of parental rights, and adoptions. She also became a specialist in handling Indian Child Welfare Act cases when Hennepin County Attorney Mike Freeman asked her to be creative and build relationships with the state’s reservations. McKeig is a descendant of the White Earth band of Ojibwe, and in 1995 a member of that band, Robert Blaeser, was appointed to the Hennepin County District Court bench, the first Native American district-court judge in the state. McKeig attended his swearing-in ceremony and recalls thinking, “Hmm, maybe I can do this someday.” Blaeser soon became her mentor. Gov. Tim Pawlenty tapped McKeig to become a Hennepin County District Court judge in 2008. For the first year of her judgeship, she heard criminal cases, but in 2009 she moved to Family Court and served as the presiding judge in that court over the final three years of her tenure before being named to the Supreme Court. McKeig was sworn in to the high court by Gov. Mark Dayton on Sept. 15, 2016. She says it was an emotional event for her. McKeig has maintained a continuing relationship with Mitchell Hamline, teaching a course in Child Abuse and the Law as an adjunct professor. McKeig first began working on development of that course while she was still a prosecutor, in conjunction with the National Center for Prosecution of Child Abuse, which was headed by another Hamline Law alum, Victor Vieth ’87. Vieth, director of the Winona, Minn.-based Gundersen National Child Protection Training Center and a former prosecutor in Watonwan and Cottonwood counties in Minnesota, has known McKeig for years and recalls her providing valuable information about the Indian Child Welfare Act in presentations at the National District Attorneys Association.